Finally, a way to handle important legal documents that provides a safe, protected and always available place to get your papers. It's a simple concept. Create an online password protected secure web site portal where an attorney can upload client documents for the client's review and have them shared by others who need to see the documents. 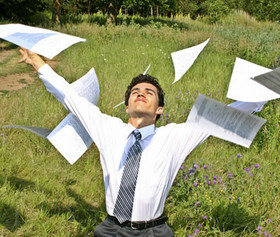 Literally, put an end to the constant paper chase and all the lost papers, wrong versions and flimsy excuses. Put an end to email attachments that are too big, and an end to misspelled email names and discover a new way of interacting with your lawyer. Mistakes will be made, that is the nature of life, but with a central portal for all important documents those mistakes will be few and far between. I have spent countless hours testing all different variations of this idea and finally chose to integrate the LeapFILE system into the MarcianoLaw website because it is simple, it does not require a registration process and it just works. Once your documents are uploaded to the Web Portal on the MarcianoLaw website they can be viewed and printed by you. Furthermore, you can upload documents to my office and my staff will post them to the portal so that the portal becomes a central location for your closing or case. Please email me with any comments or questions and of course feel free to call, fax, mail or email or just shout out if I can be of any help. Any system, any innovation is of course secondary to one on one personal service. And click on the Login button. You will be taken the File Portal called "New Client Portal Area" Then Click on the words "New Client Portal Area", which would be your name if you were a client of the Law Firm, and you are taken to the file repository where I have posted some form documents. If this were your site, you would type in your email address and be prompted to enter a new password and you would then simply go the MarcianoLaw website and login to find all your files. This innovation makes the entire process of distributing documents simpler and more direct. It will dramatically improve communications for all connected to your file. I have invested in the future for the benefit of my clients. There really is a difference in the professionals you choose. Please consider the Law Office of Frank Marciano. To set up a consultation concerning any real estate closing, contact us online or call us at 201 656 1000.